Following its launch at last year's Sydney Boat Show, Seawind Catamarans' 1160 looks to become the company's top-selling model - there are 20 boats on order and the production line's at full capacity. With any luck, it may soon be distributed in New Zealand. Lawrence Schäffler took one for a sail. Seawind Catamarans - based in Wollongong, south of Sydney - is Australia's largest manufacturer of cruising catamarans and its most successful model is the 10m Seawind 1000: hull #150 has just rolled off the production line, 10 years after the model was introduced. But if current projections are anything to go by, that performance may well be eclipsed by the 1160 (11.6m). Like the 1000, it's a sharp looker that's easy to sail. Light and nimble, it accelerates quickly and responds instantly to the helm. That's complemented by oodles of free-flowing space, stylish decor and generous living areas. It's not difficult to understand its appeal. Other than size and layout, the most significant difference (compared with its smaller sister) is in the construction and assembly process: it employs a system designed to simplify and accelerate the production cycle - and accommodate the growing demand. Using fibreglass, sandwich foam construction, the 1160's entire structure only uses five components. There are two main sections (a one-piece, twin-hull assembly that mates with a one-piece deck assembly). Before they're joined, three interior modules that incorporate all the recesses, spaces and surfaces of the accommodation and living areas are installed. All modules are structural (there are no bulkheads in the hulls) and the finished assembly is a complete, monocoque structure. Auckland's High Modulus oversaw the engineering and development of the tooling, ensuring that the five-mould process would maximise strength and rigidity while capitalising on the boat's production turnaround potential. The strategy immediately proved successful. Seawind currently employs around 55 people and is producing 25-27 boats a year. But given the growing demand, that tempo may soon prove inadequate, and to further boost production efficiency the company is phasing in infusion technology. "It's faster and cleaner and makes it easier to comply with environmental controls," says managing director Richard Ward, "not to mention benefits such as greater consistency in the manufacturing process." Great aesthetics and plenty of functional space. That, in a nutshell, describes the Seawind 1160. For me, the top attraction is the indoor/outdoor area created by the large cockpit and the saloon. Plenty of seating in the cockpit, including a thwartships bench aft that's divided by a no-nonsense, gas barbecue. It all shelters under a Targa arch spanning the back of the cockpit. This has multiple uses. 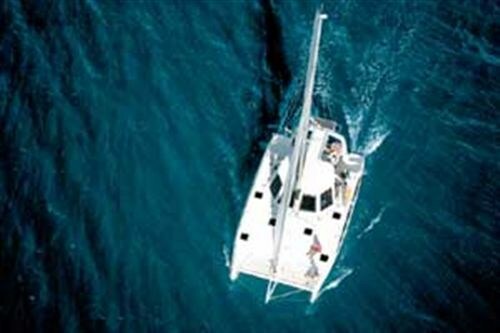 For a start, it hosts the mainsheet and traveler system, so tangled sheets and lines are not even an option in the cockpit. The arch also carries a pair of 120-watt solar panels and supports the inflatable, hanging from davits between the hulls. My favourite feature of the 1160, however, is the folding/lifting door that instantly converts the cockpit and saloon areas into a single, integrated space. Once folded (and it's a tri-folding door), the bottom of the door unclips. The top section is hinged, allowing the folded assembly to be winched up and stowed away in the cockpit roof. It creates a superb indoor/outdoor flow area. Inside, the saloon and its large, U-shaped settee are surrounded by large windows that provide plenty of light and excellent visibility. The forward windows open on gas struts, ensuring good ventilation at hot anchorages. Versatility rules: the saloon table - on a single, offset pedestal - can be rotated through 90o and lowered or raised. This variation creates: a dining table (standard mode), a smorgasbord (pivoted 90o), or - when lowered and nestled into the settee's U-recess - another large sleeping area. All in all, the arrangement offers great party and entertainment facilities. 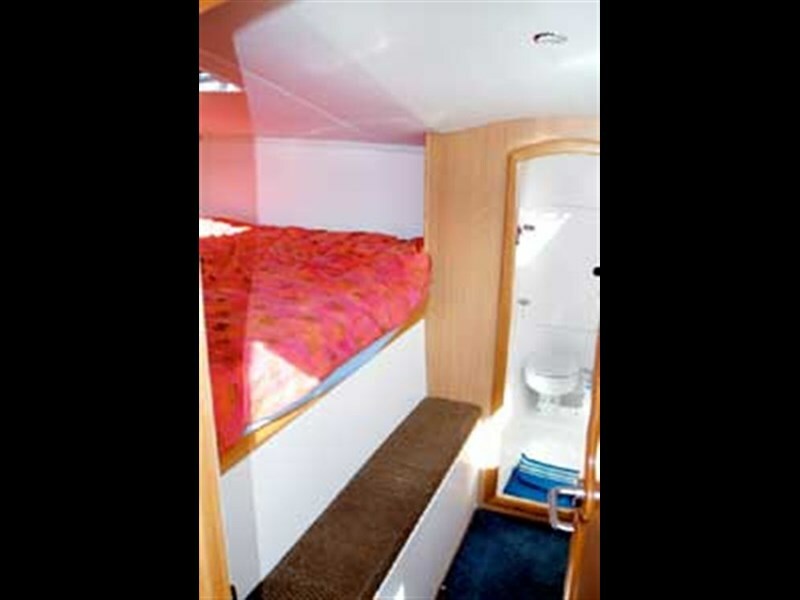 Access to the galley and accommodation below is via twin companionways, port and starboard. The decor's a pleasing mix of oak joinery, bright surfaces, gleaming varnish, teak strip floors and colourful upholstery. The galley's an airy area immediately down from the starboard companionway - ideally positioned for passing up snacks and drinks. Its designers have created large, functional working surfaces, surrounded on the inboard side of the hull by a 240-volt microwave oven, three-burner gas cooker/oven and twin, stainless steel sinks. Opposite is a fridge and separate freezer, with a wide selection of drawers and lockers below both surfaces. In the port hull, the same area is allocated to the navigation table, electronics and 12-volt switchboard. Seawind 1160s are available in a three, cabin layout for the private cruiser, or four cabins for larger families or charter vacations. The two forward cabins (with queen sized beds) lie between the hulls, while the aft cabins (slightly smaller) are in the rear sections of the hulls. All berths are oriented fore and aft, though owners can opt for a thwartships, double berth, island configuration for the forward, port (master) cabin. I saw both options, and far prefer the island bed configuration. It not only offers shelves on either side of the bed (for books, cups, whatever) but also allows you climb in and out of bed without disturbing your partner. There are two bathrooms - a main, larger one in the port hull (serving the master cabin), and a smaller, en suite unit forward in the starboard hull. Both are equipped with manual heads and holding tanks. Current models are also being fitted with grey water tanks. The vanities have hot/cold water mixers, with a separate shower. Light and airy, the bathrooms are equipped with generous storage. It's a very user-friendly boat. With modern surfaces that are easy to clean, it's also a visually appealing and low-maintenance boat. 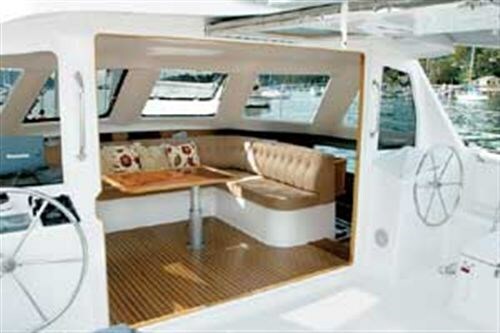 Its sweeping curves and stylish design reflect the extensive sea-going experience of the in-house design team. So how's she sail? Can't fault it. We sailed in very light conditions as well as in a more satisfying 15 to 18-knot wind. With the self-tacking jib (which uses a single sheet), going about is a piece of cake. She's very light on the helm (push-pull cable with a connecting member to the two quadrants. The connecting member is hidden inside the aft beam). The big, fully battened main is a powerful beast, and she reacts quickly to the slightest puff. In 15 knots of wind, we were broad reaching at a comfortable nine knots. With all lines leading back to the cockpit, the 1160 is simple to sail. The cat holds her course reliably, but even if you were short-handed and needed to cross the cockpit to tend various sheets, there are the twin helms that allow you to make any course adjustments "on the fly". The main traveller is fitted to the top of the Targa arch, and again, it's a one-sheet, continuous system that's adjusted by cranking a recessed winch on the arch's starboard support strut. As an optional extra, owners can have a bowsprit fitted to the cat's forebeam. It's designed for flying a screecher in light-wind conditions. A genniker is also offered as an option. I particularly like the Ferrari mesh on the trampoline. It's plastic covered fiberglass and with relatively small holes, it's easy on bare feet. The mesh is welded rather than stitched, and didn't seem to provide too much of a barrier to enthusiastic waves. An interesting design feature is the "bulge" or flared profile on the inboard side of the hulls. 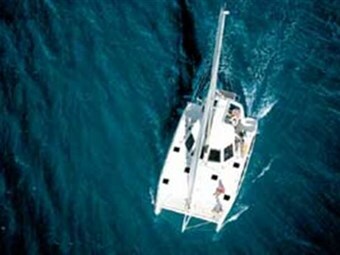 It provides enormous reserve buoyancy and extra lift - but only when it's needed, in big seas. The flare begins above the water line, and doesn't create drag in calm conditions. That has allowed the cat to retain its aesthetically pleasing, fine-entry bows. A secondary benefit of the flared profile is the additional space it creates within the hulls. The hulls also feature mini keels (rather than dagger boards) to minimise slippage, and they are sufficiently robust to allow beaching. The cat balances easily on the keels. This also simplifies hull scrubbing/anti-fouling sessions. For and berthing and anchoring, Seawind 1160s are fitted with twin, 30hp diesel engines (Yanmar or Volvo Penta), mated to sail drives with two-blade folding props. They propel the cat's six tonnes with ease, and set so far apart (the beam is more than six metres), they make for easy manoeuvring, spinning the cat on her axis. Is it a reliable, sea-going vessel? It appears so. A number of the cats have been delivered to Perth via the Torres Straits (a trip of 5000 miles) and some have been sailed to Fiji and New Caledonia. There is a Seawind 1000 in New Zealand, and many are used as charter vessels in the Whitsundays. The cats meet the USL code and Australian Standards, and are built to CE certification. 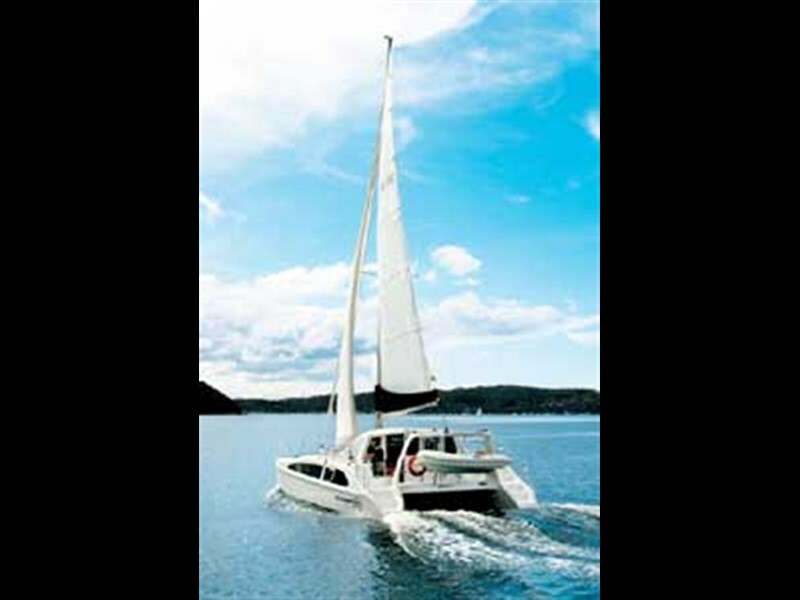 Depending on the outcome of current negotiations with a potential New Zealand distributor, Seawind catamarans may soon be available locally. More on that as soon as we know. In the meantime, if you are considering investing in a new cat, hop aboard the next flight to Sydney and arrange a sail. Even though it is Australian - you won't be disappointed.